On one side SS Rajamouli’s magnum opus Baahubali inspired the whole nation with its art and the set and on other hand is slowly nearing the Rs 600 crore mark at the global box office. Baahubali, which is more of a visual spectacle has been an brainwave to many filmmakers and has set new benchmarks in film making and presentation. But the movie has not just motivated directors only. 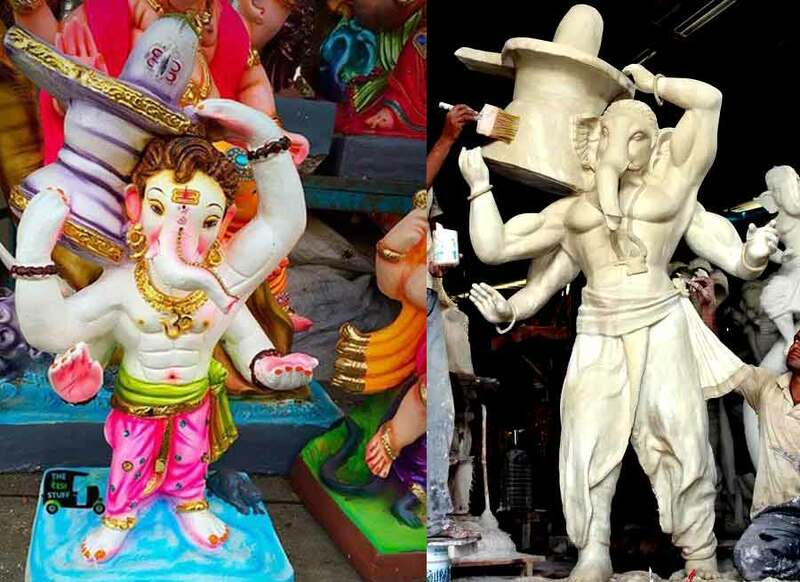 It has also inspired several idol makers who are making Ganpati models in the same pose as Prabhas from the Baahubali poster. The Ganpati idols come in both mini and medium sizes and look really delightful. Striking the same pose as the on screen Baahubali from the film, with the Shivling, more and more idol makers have hand crafted such Ganpati idols, ahead of Ganesh Chaturthi. Now our Ganpati Bappa is more muscular and even has six pack abs to display. The Baahubali styled Ganpati idols are selling like hot cakes in the market as well.